I accidentally timed my arrival in Antigua with the blooming of the jacarandas in its main square. No accident though, was my plan to see its Semana Santa celebrations, the most elaborate in Latin America. The city’s holy week is particularly notable for its combination of two cultures: Roman Catholicism that was brought by the Spanish conquistadors and ancient Maya tradition. This complex relationship has itself, over centuries, become a facet of Guatemala’s unique identity. Today people from around the globe join its people for what is the busiest week of the year in Antigua. Activities and processions are centred around the city’s Cathedral de Santiago and its adjoining cobbled streets, where food, textiles and toys of all sorts are sold by people from local villages. Throughout the week, spectators smother the pavements in front of Antigua’s smart restaurant courtyards that tempt large families and tourists with the promise of long lunches and fine wine selections. Overlooking proceedings, the blooms of the jacarandas compliment the rich yellows in the religious alfombras (carpets) and almost match the shades of the deep purple processional robes, which for centuries first in Spain, and then Latin America, have denoted royalty and suffering. Appreciation for this extreme dedication to a faith and all that comes with it isn’t lost on me as an Atheist. On my travels I continue to be taken in by the spectacles, architectures and sensory atmospheres that are created by religious devotion. Antigua’s Semana Santa was no exception. Processions take place throughout the day and night, so local and visitors alike grab food when they can. Several squares fill with stalls as early as 9am. 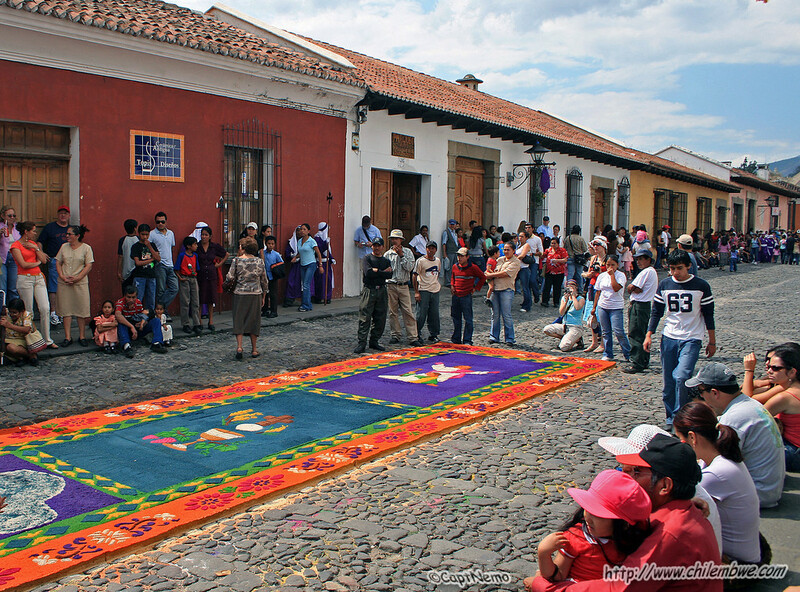 Throughout the morning, dedicated locals get on hand and knee to make the alfombras. They use a mix of seeds, powders and flowers to create works of art. Spectators from Antigua, surrounding cities and the rest of the world battle for the best position to view the processions. Tradition dictates that young boys lead the procession, sometimes having to carry heaving staffs or tronos (floats). There are many different roles within one procession, including references to the ancient Roman Empire. Two youngsters grab a small souvenir before they get whisked away by the procession. The alfombra is usually left untouched until the arrival of the central part of the procession and the trono. Often very heavy and elaborately decorated, the pain in the faces of those carrying the trono is visible. They pause before walking the alfombra. A key part of the procession, and usually the most watched – the trono passing over the alfombra followed by a band playing evocative music. All the colours of the alfombra mix together as they are walked upon. These carpets are laid to ease walking over the cobbles. More pretty souvenirs for children after the procession has passed. The road returns to normal relatively quickly. Amid all the human celebration, it’s sometimes easy to forget the raw nature of Volcan Agua that sits over the city. When dusk falls, the processions take on a more sombre air. The strong incense burners create a fog over Antigua’s streets. The purple robes have long represented royalty and suffering. The tronos have lights, so that they can be seen in the night time processions. Antigua’s main square is impassable during the height of a procession, like this one on Good Friday. While men carry Christ on the cross, women carry tronos featuring the Virgin Mary. Every detail of the costumes and decoration of the tronos has been carefully planned. From Antigua’s rooftop bars, the wider impact of its Holy Week processions can be felt, with roads closed to cars and incense rising into the surrounding mountains. Have you watched Semana Santa processions anywhere else in the world? What were your impressions? Thanks for your thoughtful comment 🙂 Like you I often find myself surprised at how easily I get wrapped up in the emotion of it all. Antigua is a fantastic old city that interestingly has a completely different feel either side of Semana Santa – tranquility is resumed within a day of the final procession! 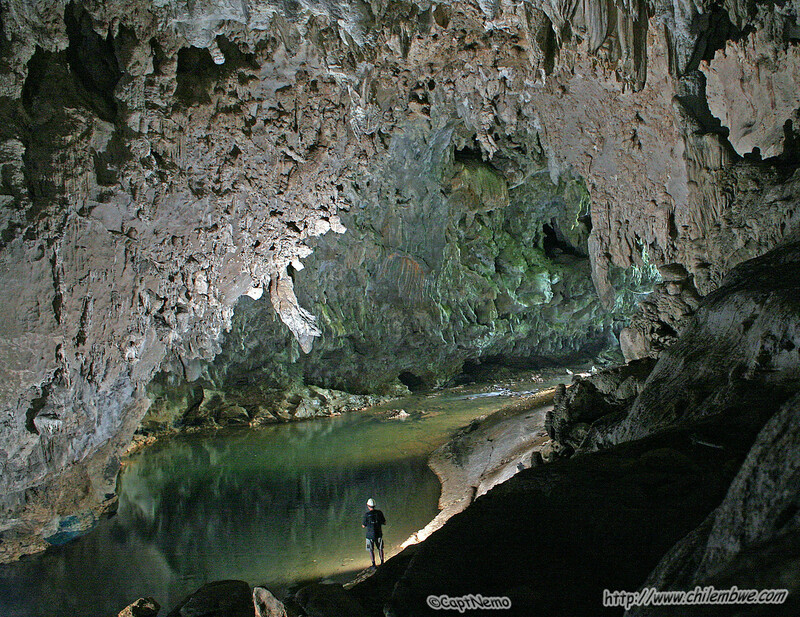 Haha there’s also lots of good hiking around the area too – Antigua’s the perfect base city for exploring!